Over the past few decades California has cemented itself as a leading New World wine producer, and while the big names from Napa and Sonoma may be at the cutting-edge of that wine revolution it’s really the smaller boutique players that are consistently churning out affordable but quality wine to meet the needs of the average wine quaffer. 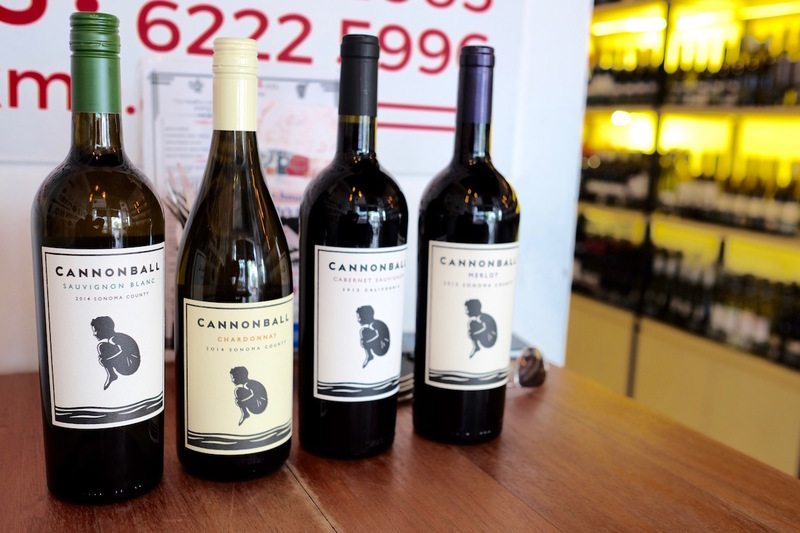 Founder and partner of California-based Cannonball Wine Company, Yoav Gilat, was recently in Singapore to promote its wine – carried by its local distribution partner BrandConnect Asia – so we snagged him for a quick chat about their philosophy towards making wines that appeal to the modern drinker. Tell us about Cannonball Wine Company. Why the name? My business partner Dennis and I started the winery about 10 years ago, in 2006. The winery, vineyards and winemakers are located at Healdsburg, California. Dennis is in charge of making the wine. He’s a Sonoma County native, and has lived in the area for over 50 years. His family owns and manages vineyards. Cannonball refers to jumping into the water with your knees tucked into your chest – like when you were a child and you ran to dive into the water and make a big splash! The Cannonball icon is a symbol of your inner child; that uninhibited spirit is the soul of Cannonball Wine. Cannonball wines will make you smile and remember to not to take life so seriously. We make wines that are approachable. What I admire about Dennis’ approach to making wine is that he is very open to consumers. He always wants to know what they like, and is trying to satisfy palates instead of just making wine (to fit a certain ego). Too many wineries and winemakers are making very big wines – there’s a place for wines like that, but sometimes you need a fork and knife to drink some of those wines. So the leaping boy on the label symbolises us as a New World wine that appeals to a younger, new generation of wine drinkers. There are enough Old World wines out there; we want to do something that’s targeted at the new generation of wine drinkers. Your labels are certainly different to those those of other brands. I just decided that I didn’t want a picture of a vineyard or a chateau on the label, mostly because I don’t personally own a vineyard or chateau. I didn’t want a landmark either, because it’s not likely to help consumers – for example, which bay is a good one? Is it Cloudy Bay or Oyster Bay? We wanted something that people can recognise and remember, and get a positive reaction from it. That’s also the spirit behind the wine. Sometimes some labels can make wine more pretentious that it is, which can scare away consumers. They walk out of a store empty-handed because they get intimidated by labels like that. How did you get into the wine business? How did you meet Dennis? I was originally born and raised in Tel Aviv, Israel; I moved to California about 15 years ago. As you can tell my name is Gilat and not Mondavi; I didn’t inherit any vineyards or any lands, and I’m not from the industry. But I loved wine and was exposed to it from a very young age, and my family always had a bottle of wine on the table at home every day. I worked at the age of 16 at a restaurant in Jaffa, so I was exposed to the restaurant trade from young. That’s where I started to learn about food and wine, and about managing a bar. I did the whole thing, from a busser all the way to general manager. I did learn, though, that the kitchen wasn’t for me! Before this I was an attorney. I studied law in the UK and then I practised law for two and a half years. Interestingly all the deals that I had done was always related to food. My clients would tell me that it seemed I was really interested in the restaurant business. I realised that it was my passion. It was while I was consulting on a project with a spirits company that I was lucky enough to meet Dennis Hill. At that time he was working with brands like Blackstone and Hayman & Hill, and was a winemaker at Alexander Valley Vineyards and Seghesio before that. If you’ve tried our range I think you will agree with me that they are very fruit-forward. There’s very little manipulation in our wines. There’s nothing wrong with heavily-oaked Californian Chardonnays, but I personally prefer the Chablis of the world. Neither did I want to do unoaked Chardonnays. At the beginning we just made one wine, which was the Cabernet Sauvignon – it was our signature wine. At that time we decided to do just one wine, and that was the one. The first vintage was 2005, and we released the wine in 2007. Even for our second wine, the Chardonnay, it was only after much discussion with Dennis that we decided to make it – I was really not convinced that this was what I wanted to do. Our first vintage of the Chardonnay came out in 2009, five vintages after our Cabernet Sauvignon. On the other hand when Dennis wanted to do a Merlot, I was all in. I love Merlot. Merlot used to have this bad reputation – it’s like it’s almost an insult if you brought a bottle of Merlot to a party. “Merlot will come back,” I remember saying. Over the years Dennis has built relationships with growers from all over the region, and we’re lucky enough that they want to work with us and provide us with fruit to make different wines. But for the most part, the backbone for our Chardonnay and Merlot also come from the vineyards owned by Dennis and his family. It’s a lot easier for a winemaker to make wine from the vines he planted and understands. Most California wineries would choose to specify the AVA (American Viticultural Area) on their bottles to indicate specific terroir – and also charge a bit more – but we notice Cannonball seems to steer clear away from them. We wanted to keep things flexible. We didn’t want to be in a situation where if there was a bad vintage we are stuck with a specific appellation that we cannot produce for. Sonoma itself has a lot of microclimates – Dry Creek, for example, is very different from Russian River – and we just wanted to be sure we had the flexibility to make and blend our wines, such as when we make our Californian-style Cabernet Sauvignon. Interestingly the only Cannonball wine that is more than one varietal is the Cabernet Sauvignon; the rest of the wine are actually 100% single varietal. The Sauvignon Blanc is a 100% Sauvignon Blanc from Dry Creek. How does it feel when you make wine that is affordable back home, but when it’s on the shelves in Singapore that exact same wine is so much more expensive due to our alcohol taxes? So here’s a funny story. I was at the beautiful Lake Louise in Alberta, Canada in the middle of the mountains, and in this particular venue that was selling 50 cases of our wine every month. We were there for a meeting, and when I was seated looking at the wine list, and found that our wine was going for something like 120 Canadian dollars per bottle. The manager saw my jaw drop and asked if I was ok, so I told him my concern. He smiled and proceeded to open the curtains. “You see the view? This is why I can charge that amount.” I stopped mentioning about the prices then. I realize that every market works differently, and we try to support each market as much as we can to get to a price where our wines can be served on-premise by the glass. We don’t care if it’s a dive bar that sells sliders, or if it’s a white tablecloth venue with Michelin stars, we like to see our wines served by the glass – it’s the best way to get noticed by consumers. Where do you see Cannonball in three to five years’ time? Nowhere different from where we are now. We have a new project called High Dive, which is a small production batch we’re working on with Napa Valley’s Scott Palazzo (of Palazzo Wine) and Peter Heitz (of Turnbull Wine Cellars). 3000 bottles of wine, it’s not that big. The 2014 vintage will be released next August, so we still have some time. I wanted to continue making wine I love drinking; I want to make wine that I can bring to a party with friends and family on a Friday night, and have them go “Yes I’d love to drink that again sometime”. I’d know I did something right. That said I want to make a splash, a dent in the wine industry. We want to continue to change attitudes about wine. Sourced from the sustainably farmed estate vineyard, Adam & Eve, in the Northern Russian River Valley, as well as some favourite vineyards in Sonoma Valley. The 2014 is 91% Merlot blended with small amounts of Petite Sirah and Syrah for complexity. On the palate the wine is medium-full bodied with classic Bordeaux proportions, wonderful concentration, with flavours of cherry, rich chocolate and spiced cake. The wine finishes with perfectly balanced texture and flavour and a refreshing brightness.